This is used for monitoring arterial oxygen concentration and heart rate (pulse). PACK SIZE: 1 device in a box. Accusure Pluse Oxi Meter is Perfect for monitoring arterial oxygen concentration and heart rate (pulse). In human body blood contain Haemoglobin. Heamoglobin trap the oxygen from the fresh air & supply this oxygenated blood to the every part of the body through artery. Oxygenated blood after reaching desired part of the body , heamoglobin get seperated from the blood and blood become De-oxygenated. In Pluse Oxi Meter there are two side . One side have Red Light & Infrared Light and on the other side it have sensor or Photo detector. In the human blood Oxygenated Hemoglobin absorbed simple red light more & deoxygenated Haemoglobin absorbed Infrared light more . When finger put on between these two light & Photo detector sensor Then the blood present in the finger absorbed the simple red light & Infrared red light both. Photo detector easily sense the how much quantity of the light are absorbed and easily find out how much Oxygen are present in the blood of patient. In heart during heart beat for some seconds blood volume increased in the artery & at this time simple red light get more absorbed. When blood get absorbed simple red light more or less then peak form. 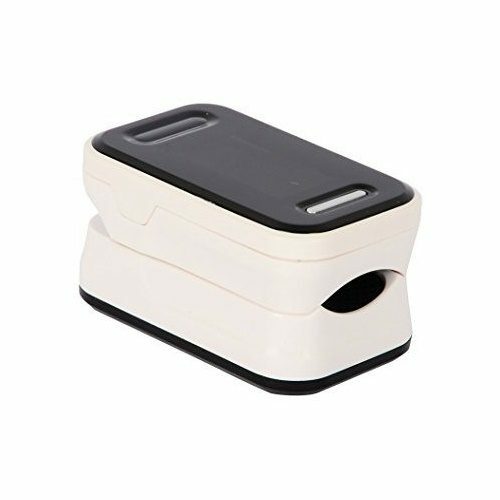 All Peak count by the Pulse Oximeter which help to determine the Pulse rate. This have Two parameters Sp02, pulse rate. This have Four-way directions adjustable display. This have Low voltage indicator. This is Automatically power off. This is convenient to carry.